It Makes Brushing Okay, I Suppose. | ARChive of Contemporary Music, or "Would You Take My Mind Out for a Walk"
It Makes Brushing Okay, I Suppose. 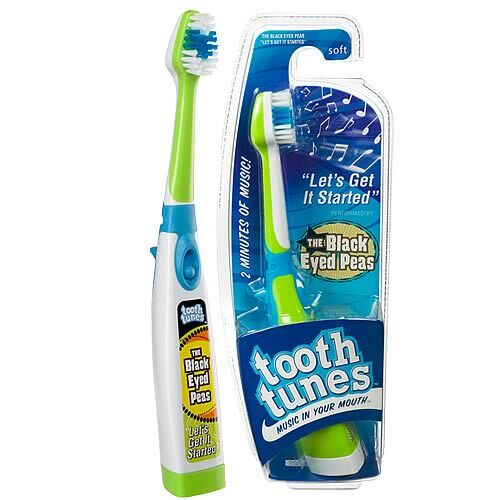 Hasbro has a product line called “Tooth Tunes” which consists of toothbrushes that play music while you brush your teeth. What makes these toothbrushes different is that you hear the music through your teeth via bone conduction while you brush. They even have a new commercial that makes brushing your teeth look like rockin’ party FUN! A neat idea, but I wonder: were I to get the Kiss “Rock ‘N Roll” all night brush, or even the Black Eyed Peas “Let’s Get It Started” brush, would the party in my mouth rock so hard that my bridges would fall out? F – I – N -A – L – L – Y !!!!!! A reason to brush my teeth. I will record it with my grampaphone. Hey, if you think you can make a party out of it, submit it to the contest. This is a perfect platform for “Postive Dental Outlook” by Crucial Youth, or any song performed by Doctor Teeth and the Electric Mayhem!